We just photographed a project that was 2 years in the making! 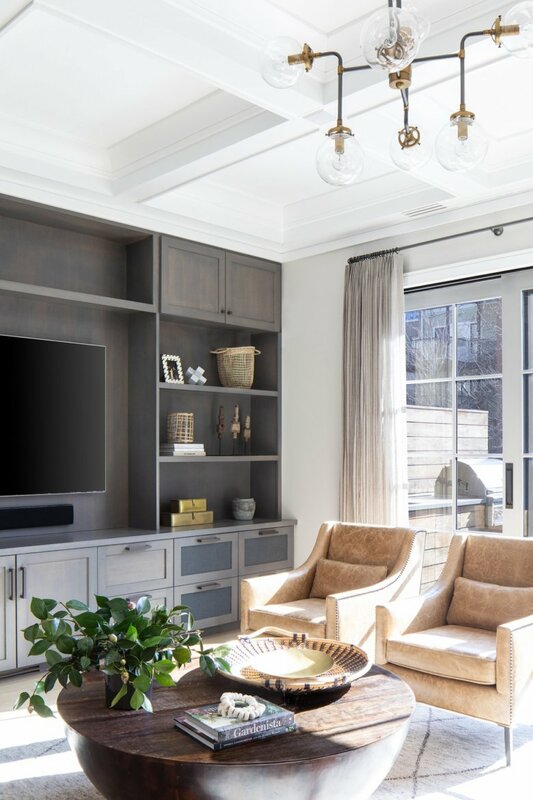 we worked closely with a family who purchased a property in the downtown historic district and took an old outdated brownstone and combined it with the carriage house next door to create an expansive single-family home. We’re giving you a b. t. s // behind the scenes look at a few of the spaces and we’re so excited for you to check it out. We worked with a killer team on this project – Brinton Brosius Inc. was able to make all of our conceptual designs a reality. the left side of the house used to be a single-story carriage house that we pushed back and built up 3 stories. while we didn’t design the exterior of the house, we selected the historic windows from Parrett, designed the custom door and sourced the exterior lights. As you enter the home through the vestibule, you immediately see the custom steel doors and the 8’ pocket doors. There are 2 additional sets of these pocket doors on the first floor. We felt this detail was important, as it speaks to what would have been there back in the early 1900’s when this home was built. The curved stair was a really special detail, as it goes all the way up to the third floor. there are no 90-degree angles at all and that allows the handrail to be continuous -- you don’t see that very often anymore! Also, the light floor and the dark handrail create a dramatic moment in the entry hall which is otherwise very minimal. The kitchen and great room are one large space so we kept the cabinetry style and color consistent - millworks is a great way to unify spaces. because of the neutral palette, we played with texture and finish to bring depth to the space. we always love to use leather somewhere and the leather chairs in this room are the perfect way to add some warmth. because the dining room is set between the great room and the living room, we wanted to create a moody feel in here. We painted the walls a dark olive green and mixed wood tones and metals to bring structure and contrast to the space. because we mixed finishes, we felt it was important to keep the beams the same color as the floor instead of contrasting them, which is our usual choice. the statement making light fixture was an all-around favorite on the jobsite and to the homeowner alike. a mix of vintage and new accessories were selected to bring a lived-in feel to this room. I'm Victoria Balson and I'm the author of this amazing blog!